Popularly soups can be divided into two groups: CLEAR and THICK soup. Clear soups are generally more healthy as they have the least amount of calories while thick soups usually contain a lot of starch, sometimes cream, and other high carbohydrate ingredients. Personally I am a big fan of Clear Soups. This chicken and vegetable soup is not only mouth watering & colourful, it’s super healthy and easy to make too. This is made with clear strained broth. A meal in itself that you can serve with crusty bread. 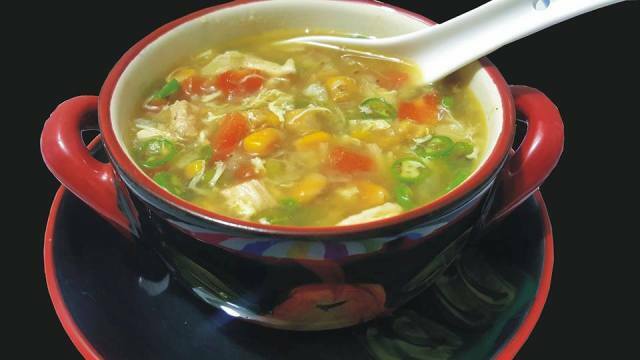 This ultra-flavorful Chicken Vegetable Soup is all you need to stay warm and healthy in this cold weather. Put all ingredients in a cooking pot,when it starts to boil foam will appear on top remove it with the help of a spoon,by removing this u will get a clear stock. When all foam removed cover with lid and cook on medium flame for 15 minutes. After 15 minutes take out chicken pieces from stock,shred it and set aside....let the stock simmer on medium low flame for 30 to 40 minutes with lid on. Stock is ready drain it through a sieve and keep aside. Fry garlic and onion in oil until transluscent. Add in peas and carrot and stir fry for 20 second. Add in cabbage and fry for 10 second. And now mix in potatoes and chicken. Pour in chicken stock, salt and let it cook with lid on after 30 minutes mash 50% potatoes (this step will thicken our soup because I am not adding cornstarch). Add in sweets corns and blended corns too (These blended corns will also thicken our soup). Add black pepper mix well and simmer for 10 minutes. Then on boiling soup pour eggs and stir a little. Adjust salt and pepper according to your taste.